The Egg Cube (エッグキューブ Eggukyuubu) is the fourth boss in Sonic Advance 3, and is fought in Toy Kingdom's boss Act. Eggman uses what is essentially a jack-in-the-box with a cockpit at the front (fans refer to this strange boss as the "Egg-in-the-Box" or, less frequently, the "Egg Toy Box"). Inside the box, Gemerl emerges after every hit as part of one of the box's weapons. Eggman will reveal himself from the side of the box in his cockpit, and will gradually inch his way to the left side of the arena if left alone. If he is allowed to reach the far left side, the box sweeps back and forth at high speed (potentially shoving the player off the edge) before settling back in the middle. Unlike other bosses, this boss is not defeated simply by hitting it enough times, but by forcing it off the right side of the arena by hitting it. Technically, the boss could last forever if you turn the time limit off in the options. A missile which flies off the top of the screen, and homes in at the player at high speeds. Thus, the player must keep moving to avoid the missile. A red arrow sweeping the ground indicates where the missile is predicted to land. When the explosion clears, Gemerl is left standing, with the Gizoid hopping back into the box shortly afterwards. A spiked ball-and-chain, which bounces off the ground and is difficult to properly jump over. After it comes to a rest, the ball-and-chain is retracted back into the boss. A giant clown head (complete with Gemerl as a nose) that springs from the top compartment. This action is harmless, though it may throw the player off balance in the later portions of this boss fight. Also during the fight, Eggman will toss three toy-soldier badniks onto the arena, which bounce once and then fall off the bottom of the screen. Unlike the similar badniks in Acts 1-3, these will not fire off projectiles, but will complicate your efforts by crowding the arena. These badniks can be destroyed normally, but will not leave behind rings. 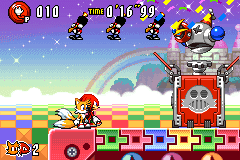 The more Eggman is forced further to the right, the more often he releases a these soldiers to hinder the player. The player cannot attack the boss when an attack is performed. They can only hit him when the cockpit appears, which is right after any of the previously mentioned attacks barring the soldier attack. Once the box drops down the right side of the arena, Eggman will haul himself and Gemerl out of pit, and the player will move on to Twinkle Snow. This page was last edited on 17 February 2018, at 12:36.